Mobile Home Insurance Quote : Professional Insurance Systems of Florida, Inc. Even though most mobile homes in Florida are now built to the same standards as a regular site built home, in some cases higher, it’s still difficult to obtain insurance in most areas. We’ve forged relationships with the most pro-active Florida insurance companies to offer our clients the best options available. What coverage should I carry on my Florida mobile home insurance policy? Special or Basic – In Florida your mobile home insurance is likely to be an HO-3 (DP-3) or HO-8 (DP-1) policy form, otherwise known as special form or basic form. Each policy form is packaged with both property and liability protection but the extent of the protection varies widely between forms. Knowing the differences between these policies can help you make the right insurance decisions. It is very important to check your policy form to see which of these coverages you carry. HO-8 or DP1, the basic form, policies are by definition the most basic type of Florida mobile home insurance available. Basic form policies protect against specific perils only such as fire or lightning, wind or hail, smoke, explosion, riot and civil unrest, vandalism or malicious mischief. Things like theft and water damage may not be covered. Protection is only for the things specifically listed in the policy, so you may not be covered as well as you would like. This product carries with it a list of excluded coverages and limitations. 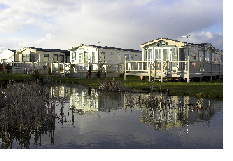 HO-3, or special form, policies are the most common type of Florida mobile home insurance available. Unlike the basic form, special form covers all causes of loss except those which specifically are excluded by the policy. Special form also includes loss of use coverage, which pays for the living expenses you incur if your home is unlivable during repairs after a covered loss. There is also typically a no-fault medical coverage for minor injuries to guests at your home. Florida mobile home insurance property claims are settled in two ways: replacement cost (RC) and actual cash value (ACV). A replacement cost settlement will pay up to the replacement value cost of the home, but an ACV settlement will depreciate the value of the home based on age and condition at the time of loss. Special form policies are generally written as replacement cost but basic form policies are generally written as actual cash value. Your contents inside the home are also settled under replacement cost or actual cash values. Make sure you have replacement cost coverage if you would like to replace the items in your home with new items instead of used. Do you have an older Mobile Home?